There are many different materials used for Tombstones and cemetery markers. Here are a few samples. Concrete is made from cement mixed with granite or limestone gravel, sand, water and various other chemicals. It's commonly used in building. It's not commonly used for cemetery monuments, but, as you can tell from the picture, the tombstone has crumbled significantly. 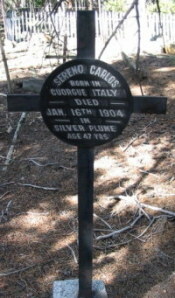 Concrete is not a common material used for grave markers. 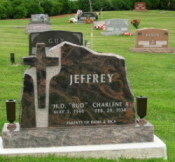 Granite has become the standard stone for cemetery markers. Originally, the hardness of the material made it difficult to use for such purposes, and it required highly skilled stone carvers to produce acceptable results. Granite comes in a wide variety of colors, and today, carving is done with rotary bits and sandblasting controlled by computers. Because the computers do the carving, the design choices are nearly unlimited. When you think of granite, think counter tops. Granite began to be used for markers in 1860, and is the most commonly used marker material in use today. All of the markers in the sample image are made of granite. Limestone is calcite, and ranges from pure white to brown. One of the best known structures made of limestone, are the pyramids. It is a soft material, and can degrade quickly in harsh weather conditions, especially acid rain and the like. Marine organisms provide most of the calcite in limestone, so, you can often see fossils of shells or coral. Marble is "grown-up" limestone. That is, marble is limestone that has been transformed into a more solid form. The heat which transforms limestone into marble removes all the traces of the marine fossils from the new crystalline matrix. Marble is perhaps most easily identified by its veins, which are created due to the various levels of impurities (in the form of other minerals) in the original limestone. Only the purest limestones result in marble that is pure white, and this is the most prized form of marble. Not surprisingly, much of the marble in Colorado cemeteries is from Marble, Colorado. The quality of the marble quarried in this small town are considered to be of high quality. The marble for the Lincoln Memorial building, in Washington D.C., as well as the material for the Tomb of the Unknowns came from these deposits. 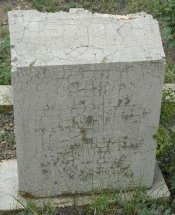 Marble and limestone markers were used primarily from about 1780-1930. Iron, in various forms, was most commonly used for cemetery markers from about the 1830s to the early 1900s. It tends to rust and decay. Inscriptions were painted or carved. Bronze is also used for markers, and is usually cast into the desired form, which means the writing is usually in relief. Sandstone, like limestone, is a sedimentary rock formed by centuries of materials compressed on the bottom of a waterway. Because it is formed form compressed sand, it takes all the colors sand takes. It is most easily identified, especially in Colorado, when it is red, as the sample indicates. Like limestone, it is soft, and can be carved easily. Which means, like limestone, it can also deteriorate quickly. It was a popular choice for tombstones in Colonial America, and replaced common stone as the material of choice. As it became clear that the sandstones deteriorate quickly, marble became the stone of choice. Sandstones were used from about 1650-1890. Stone tombstones are often made out of uncut, natural stone. Sometimes, a metal plaque is attached to the stone. Alternatively, the stone can be inscribed. 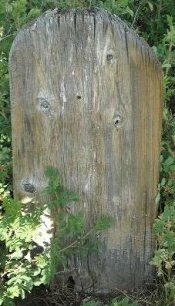 Markers have been made of wood for centuries, as wood is easy to find in most parts of the world. It is easy to carve and paint. The largest drawback to wood is that it breaks down easily. Since about 1900, wood is less common, as longer lasting options became more affordable. Sand-cast zinc was used for a 40-year period. Customers could pick from a variety of panel designs, which were cast, and then bolted together. The handy thing about these were that panels could easily be replaced, so that more names could be easily added to the monument. These tombstones were inexpensive (about 1/4 of the cost of marble), but, fell out of favor, as they were considered "tacky." These markers have, however, proven the test of time better than most of their marble contemporaries, as many have remained as legible as the moment they were cast. Zinc can become brittle, and, as the monuments are hollow, are especially susceptible to being crushed under fallen tree limbs. Curious about other Cemetery Monuments?